Summer program registration begins online Monday, May 13. For more information and each park’s address, visit www.cwpd.org. After that cold, cold winter, it will be great to get out in the warm, sunny, green parks! This summer, you’ll be able to see and enjoy many new programs and park amenities. For those who could not always get into our popular Hidden Meadows nature camp — we have something new for you! This summer, the new Sugar Valley Camp will invite children to explore nature and wildlife in Bill Yeck Park (see page 6). Also, teens can enjoy the new Teen Games and Bonfire Series on Friday nights. Who doesn’t love a good bonfire? Your Park Board is pleased to bring these and many other summer activities for you and your family to enjoy. We work to keep fees at a minimum to make programs accessible; fees are used to cover contractual instructor and program material costs. We are always listening to your requests and hope these programs match what you like. Watch for a few more surprises coming in summer as well. The long-awaited flush toilets and running water sinks are soon to open in the Oak Grove Park restrooms. Iron Horse Trail drainage swales will be filled, making the trail safer and less “buggy.” And, this summer, you’ll be able to enjoy the new nature trail at Pleasant Hill Park. Watch for work to commence to transform the old Hithergreen building and site into the community’s 51st park. Thanks to collaboration with the Washington Township Trustees, and a grant from the Ohio Public Works Commission, this 14-acre site will become that neighborhood’s first park. Special kudos are in order for our Director, Arnie Biondo, and staff for making this happen. Without their creativity and persistence, it is doubtful that we would have seen such a favorable outcome. Best of all, there are so many ways for you to enjoy the parks. Please, Explore Your Community’s BIG Backyard this summer. Hope to see you on the trails. Again, don’t hesitate to let us know if you have any ideas on how to enhance your parks. 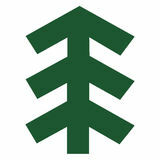 Save a Tree To subscribe to the e-newsletter visit www.cwpd.org. To stop home delivery of the printed newsletter, email your name and address to mail@cwpd.org. Staff Update Sean Kovacs recently joined the CentervilleWashington Park District as an Operations Technician II. Sean is a graduate of Hocking College where he studied Timber Harvesting and Management. He began his career with Davey Tree Company, performing diagnostic evaluations and treatments for trees and shrubs. Among Sean’s many talents and skills, he holds a certification from the International Society of Arborists. Prior to joining CWPD, Sean worked for the Kettering Medical Center for eight years. We’re happy to have him on the team! Discover a fun way to get together with your neighbors and their dogs this summer! In an effort to create more active and social outdoor spaces, we will rotate pop-up dog parks to various neighborhood parks every three weeks throughout the summer months. Temporary fencing will delineate the dog parks. Dogs are still required to be on leash when they are outside of the designated fenced areas. Rules will be posted to help everyone respectfully utilize the space. For those new to the dog park experience, see page 21 for more information about a collaborative program with Wagtown® — Dog Park Manners: How to be the Best Dog (and Human). We’re excited to be partnering with Wagtown® for this program and three others this summer! Keep an eye on our social media and www.cwpd.org for the schedule of CWPD roving dog parks! Plan to get your pup together with the other dogs in your neighborhood this summer! Jeremy is an eighth grader at Magsig Middle School in Centerville. He has been enjoying park programs for many years. His favorite part about volunteering for the Park District is that he gets to help spread some of that same joy to other children. Along with volunteering for the Centerville-Washington Park District and the Washington-Centerville Public Library, Jeremy enjoys playing soccer and basketball. His favorite hobbies are reading and helping others. The Centerville-Washington Park District would like to thank Tammi and Jeremy, and all of our volunteers, for giving their time and talents to our community. If you are interested in becoming a volunteer please contact Community Engagement Coordinator Ginger Clark at 937-433-5155 or gclark@cwpd.org. Bob Yeck was instrumental in the creation of the nature literature trails at Bill Yeck, Grant, Oak Creek South and Schoolhouse Parks. Especially proud of the trails, they combine his, and his parents’, lifelong passion for Centerville’s parks and libraries. He viewed the trails as gifts to be passed down to his beloved grandchildren and countless other children in the community. In addition to donations for nature literature trails and Bill Yeck Park improvements, in 2014 Bob also generously donated the land for Little Woods Park, your district’s 50th park. Bob was a friend to the Centerville-Washington Park District and the entire Centerville community. His commitment to bettering his community was inspirational. We are honored to have known him. Ages 3 – 4 Monday – Friday, July 22 – 26 9:00 – 10:00 a.m. Oak Grove Park, Noon Optimist Shelter 1790 E. Social Row Rd. Fee: $93 residents, $103 nonresidents Registration deadline: Friday, July 12 The essentials of soccer and basketball are introduced in a fun and safe environment with lots of encouragement. Children will learn balance, body movement, hand/eye coordination and skill development through a series of sport-specific games tailored to their attention spans. Register through CWPD or register online at www.skyhawks.com or call 800-8043509. Course number is SSA108231. Session A Mondays & Wednesdays, June 10 – 26 9:00 – 11:00 a.m. Session B Tuesdays & Thursdays, June 11 – 27 9:00 – 11:00 a.m. Children will enjoy a variety of activities such as songs, crafts, hikes and games. This station-based drop-off program is sponsored by the South Metro Optimist of Centerville Women’s Club. (AD/JK) Sign up for one session only. All children must be potty trained. Register NOW for starred camps! All other camp registrations begin Monday, May 13 at 10 a.m.
*Fee prorated for Week 5: Community ROCKS because there is no camp July 4. Before care is available 8:00 – 9:00 a.m. After care is available 4:00 – 5:30 p.m.
Hidden Meadows Day Camp encourages children to learn about nature and enjoy the outdoors by exploring Grant Park, playing games and making new friends. Campers will also be treated to guest speakers, special presentations and activities. Snacks are provided, but campers should bring a filled water bottle every day. All-day campers need to bring a packed nut-free lunch that does not require refrigeration. All campers will receive a t-shirt during their first week. Camp is held rain or shine. (AP) Week 1: June 3 – 7 Games, Games, Games Active games will be “crowned” the winner of themes for this camp week! Be sure to send an extra water bottle so your child doesn’t miss a “drop” of fun in the park. Week 2: June 10 – 14 Ancient Explorers What was it like to explore the landscape of Ohio as a dinosaur? Campers will search for fossils and seek historical answers while exploring as 21st century humans! Week 3: June 17 – 21 (Preschool Week) Under the Big Top Carnival games galore, animal fun “fur” sure and lots of exploring in the wilds of Grant Park! Week 4: June 24 – 28 Wonderful Water Fun How many ways can we use water to have a good time? Games, crafts, exploring, mixing and creating! Week 5: July 1 – 5 (no camp July 4) Community ROCKS We will bring the spirit of Independence Day to this week full of games and activities that help others in our community and help the environment. Your child’s heart will swell with pride while having fun outdoors! Week 6: July 8 – 12 Adventure Racers Adventure racing is all the rage, so we will do our own adventure racing this week. Each day we will get a “leg up” on tasks like hiking, orienteering, reading maps and trekking new terrain. On the last day, we will put our new knowledge to the test for a day full of adventure! Week 7: July 15 – 19 (Preschool Week) Naturally Watery What are the many ways we use water? Children will perform experiments that explore everyday ways water changes our lives. They will learn interesting ways water affects our community. It will be a week of natural science! Week 8: July 22 – 26 Grossology The only thing we have to fear is fear itself. This camp will separate old wives’ tales from fact or fiction. Play games with slime, see reptiles that are NOT slimy — and what about spiders? So many fun things to learn and do when you gross out! Week 9: July 29 – August 2 Heroes and Beyond Heroes wanted every day for adventures in the park! Super villains beware, we are bringing out local heroes, super heroes and environmental heroes as we play and create our summer days away. Everything good, everything magical happens between the months of June and August! Meet us at the Smith House! We will use the nearby field for games of capture the flag, dodgeball, kickball and more. Then, enjoy hanging out by the bonfire! Sign your teen up for the whole series and they can attend whichever Fridays work for your family! (AD) Teen Games and Bonfires will be canceled in the event of inclement weather. Please check www.cwpd.org for weather information. More information will be included in your confirmation email. No walk-ups will be permitted to stay at the programs. Preregistration and health history information is required. Wish you could join in the camp fun? 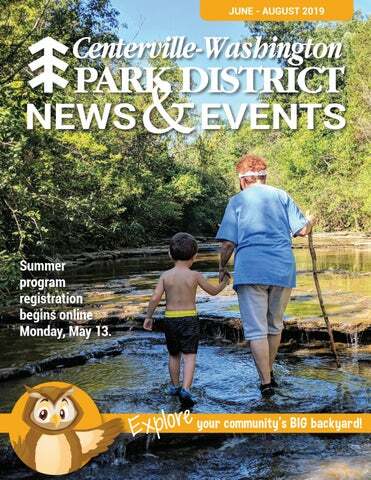 See Family Nature Camp on page 16! For additional information about Centerville-Washington Park District summer camps, please visit www.cwpd.org/programs-events/childrens-programs/ Register NOW for starred camps! All other camp registrations begin Monday, May 13 at 10 a.m.
Americana Festival Children’s Area Come early and enjoy a nutritious beverage from The Shakery Juice Bar! They will be on site from 8:00 – 8:45 p.m.
Ages 3 – 12 with adult companion Friday, June 28 10:00 a.m. – noon Schoolhouse Park 1875 Nutt Rd. The animals have taken over the park! Play a variety of games and make an animal-themed craft! Jump like an African antelope in the bounce house! Refreshments from Kona Ice will be available for purchase. (AD) Registration is not required, but please sign in your child and plan to stay at the event. Due to the high number of participants, we cannot provide supervision for individual children. All ages Thursday, July 4 11:00 a.m. – 4:00 p.m. Activity Center Park 221 N. Main St. Celebrate Independence Day at the Americana Festival! Visit our booth on Main Street and walk down the Activity Center Park driveway to enjoy children’s entertainment, food and craft vendors, inflatables and more. For the most up-to-date information on this year’s festival, visit www.americanafestival.org or the Americana Festival Facebook page. Registration is not required. (AD) Online resident registration begins Monday, May 13, 10:00 a.m. Registration is required for all programs unless otherwise indicated. Many CWPD program and events are weather dependent. Cancellations are posted on www.cwpd.org unless otherwise noted in the program description. BIG Backyard Party All ages Saturday, August 3 11:00 a.m. – 2:00 p.m. Oak Grove Park 1790 E. Social Row Rd. July Walk Wednesday, July 10 (Rain date: Friday, July 12) 10:00 – 11:00 a.m. OR 3:00 – 4:00 p.m.
Ages 3 – 6 with grandparent(s) Friday, June 14 9:30 – 10:30 a.m. OR 1:30 – 2:30 p.m. Pleasant Hill Park 358 Zengel Dr. Fee: $4 nonresidents Registration deadline: Monday, June 10 Check out the Pleasant Hill Park expansion at this summer favorite! Explore nature together on a scavenger hunt. Find big leaves, bright butterflies, neat pebbles and more! Stop to look for birds, touch moss and play along the way. After the hunt, we will enjoy show and tell, a snack and a story in the shade! Bring your cameras and wear comfortable close-toed shoes. (AD) The Intergenerational Series is only for grandparents and their grandchildren. Parents and other caregivers may attend any of our other programs. Kids Night Out: Party in the USA! Ages 5 – 15, children must be accompanied by an adult Saturday, June 1 Registration begins at 8:00 a.m., fishing from 9:00 – 11:30 a.m. Washington Township Recreation Center 895 Miamisburg-Centerville Rd. Two ponds are stocked with several hundred pounds of catfish. Fishing rods/ reels are awarded to the first three places of each age group, also special prizes are awarded for the most pounds and largest fish. Some rods/reels will be given away after derby ends. Free bait provided. Fishing equipment is not provided but some loaner rod/reels are available. Free hot dogs, chips and a drink will be also be provided. Registration closes 48 hours prior to program unless otherwise indicated. Participants should pack a lunch free of nut products that does not need refrigerated or heated, bring a water bottle and wear appropriate shoes and clothes for hiking in the woods and playing games! Session A Thursday, June 6 Wagon Trail Park 8450 Washington Village Dr. Session B Thursday, August 1 Watkins Glen Park 825 Watkins Glen Dr.
All ages Friday, May 31 – Tuesday, August 13 Owlexander is ready for another summer vacation! Will you take him with you? Color Owlexander in, cut him out and bring him along on your summer travels! Send the Centerville-Washington Park District a photo of him at your vacation destination. Every week, we will update his travel map with his new destinations! Check the map on www.cwpd.org to keep track of his awesome summer adventures! Get your Traveling Owlexander PDF on www.cwpd.org. Photos can be emailed to mail@cwpd.org, posted on the CWPD Facebook page, or posted on Instagram or Twitter with the hashtag #travelingOwlexander. Thank you to our Summer Pop-Up Park Challenge sponsors for their generous prize donations! Registration closes 48 hours prior to program unless otherwise indicated. National Get Outdoors Day Celebration All ages Saturday, June 8 1:00 – 3:00 p.m.
All ages, children must be accompanied by an adult 1:30 – 3:00 p.m. Wednesday, June 12 Red Coach Park 5500 Royalwood Dr. Wednesday, July 10 Brittany Hills Park 5825 Batsford Dr. Wednesday, August 14 Cherry Hill Park 10244 Cherry Tree Terr. Hang out on the playground, play some BIG games and meet others from your neighborhood! Bring a picnic lunch. We will provide a healthy snack to add to your picnic! (AD) Sign up for all three dates in the series, or just the ones you can attend! Backpack Adventures Rental Program New! Recommended for ages 8 and up Grant Park 501 Normandy Ridge Rd. Online resident registration begins Monday, May 13, 10:00 a.m. There are many types of crawdads! We will search for crawdads in the creek, learn about their life cycles and learn how they help keep creeks healthy! How can you help take care of our creeks in your daily life? Learn to prevent runoff and teach others how delicate creek habitats are! Did you know there used to be a mill at the Rooks Mill entrance of Bill Yeck Park? Before exploring this creek we will learn how you can use water currents to power machines! Trail is not strollerfriendly. This spot is worth the hike! We will hike to a special place along the creek for creek exploration and play. Build a boat, splash, search for creatures or just relax! Please come prepared for a hike. Approximate hiking distance will be ¾ mile on a natural trail. Trail is not stroller-friendly. All ages Friday, June 21 – Saturday, June 22 (Rain date: Saturday, June 22 – Sunday, June 23 5:30 p.m. – 9:00 a.m. Bill Yeck Park, Smith House 2230 E. Centerville Station Rd. Fee/family of up to 8: $30 residents, $36 nonresidents Families are invited to camp at the Smith House! You bring the tents and gear, and we’ll supply the food! Pitch your tent, roast hot dogs and marshmallows, play games, and participate in other camp activities! (KL) If you are bringing more than one tent, please let us know. Children must be accompanied by an adult. No pets, please. Explore nature at night with this series! We focus on different topics each month and observe seasonal changes. Please dress for a hike on a natural path. Flashlights optional. Come to nature camp as a family! Play games, go creeking, make crafts and learn about nature! Each family member will get a camp t-shirt to remember the experience! Wear clothing and shoes suited for outdoor play and creeking. Please apply sun and insect protection before the program and bring water bottles. At least one parent must be registered with a child. Non-participating family members are welcome to come, but will not receive t-shirts or materials. T-shirt sizes are not guaranteed for those registering after June 20. Join us for another year of our Shooting Stars Campout. A near-full moon will be shining on us as we roast marshmallows, learn about the moon, and explore the park after dark! Thursday, August 1 Watkins Glen Park 825 Watkins Glen Dr.
6 – 10 years Advanced Beginner 9:00 – 10:00 a.m.
A new way to get active outdoors with the whole family and meet new friends. Challenge your balance and build technique with controlled exits. Participants will find success in one or more of the fundamental slackline skills including kneeling, sitting, standing, and perhaps even walking on the line. The combination of yoga and slackline creates another level of body awareness that teaches greater balance and connection. It adds diversity to your workout, while giving you more confidence — and it’s really fun! Inclement weather information: Due to the unpredictable nature of weather, we cannot guarantee the completion of all scheduled classes. An additional week has been scheduled at no added cost in lieu of make-up classes. Tuesday, June 11 Iron Horse Park 6161 Millshire Dr.
All ages, children must be accompanied by an adult 6:00 – 8:00 p.m. Attend at least three of the 2019 Friends & Family Hikes and receive a free t-shirt! See www.cwpd.org for other hike dates! Moonlight Friends & Family Hike All ages Saturday, July 20 9:00 – 10:00 p.m. Grant Park 501 Normandy Ridge Rd. Native Plants for Home Landscapes Ages 16 and up Saturday, July 27 3:00 – 4:00 p.m. Activity Center Park, Headquarters 221 N. Main St.
Pollinators, Bees and Beyond Ages 16 and up Wednesday, August 21 6:30 – 7:30 p.m. Bill Yeck Park, Smith House 2230 E. Centerville Station Rd. New! Ages 18 and up Tuesdays, June 4 – August 6 6:00 – 8:00 p.m. Various locations Fee: $150 Registration deadline: Wednesday, May 22 Help make the Dayton area a more dog-friendly place to live! Be a part of the transformation! This 10-week service learning certification program designed by Wagtown® will educate you about increasing authentic and responsible dog friendliness in the region. You will learn about the many resources available in the area, challenges to dogfriendliness, how to get involved with local humane and dog-friendly initiatives, how to navigate the dog-friendly world with best practices, and more. Activities will include some site visits and some sessions with your dog. As part of Wagtown Ambassador Academy, participants will volunteer 25 hours assisting with CentervilleWashington Park District dog-related activities. (GC) Both resident and nonresident registration begins online at 10:00 a.m. Monday, May 13 for Wagtown Ambassador Academy. Ages 14 and up Wednesdays, June 5, July 10 & August 7 11:30 a.m. – 12:30 p.m. Bill Yeck Park, Smith House 2230 E. Centerville Station Rd. Registration deadline: The day before the program A collaborative program with CentervilleWashington History and the WashingtonCenterville Public Library, Booked for Lunch is a monthly lunchtime discussion on a historical fiction or nonfiction book. Bring your lunch and we’ll provide dessert! The library will advance order copies for participants to borrow while supplies last. (AP) Due to space limitations, pre-registration is required for all Booked for Lunch meetings at the Smith House. A monthly drop-in discussion of the same book is also offered on the same day of each month at the Woodbourne Library from 1:30 – 2:30 p.m. Shelter Reservations Perfect for birthday parties, graduation parties, family reunions and more, large group shelters are available in eight CWPD parks. New this year, shelter reservations may be made online! You may also reserve a shelter in person during office hours. We are unable to take shelter reservations via phone at this time, but we are happy to answer your questions at 937-433-5155. Visit www.cwpd.org/parks/reservinggroup-shelters/ for more information about each shelter, the reservation fees and to make your online reservation! Session B Thursday, June 20 (Rain date: Friday, June 21) 9:00 a.m. – noon Activity Center Park, Headquarters 221 N. Main St. Registration deadline: Wednesday, June 12 Learn the art and craft of nature photography with professional photographer Jim Crotty. Session includes field and classroom instruction on the basics of exposure, composition and learning to use camera settings to best serve your creative vision. Ages 18 and up Saturday, July 13 ew! (Rain date: Sunday, July 14) N 9:00 a.m. – 4:00 p.m. Bill Yeck Park, Smith House 2230 E. Centerville Station Rd. Fee: $75 residents, $95 nonresidents Registration deadline: Wednesday, July 3 Bring out your love of nature and creative vision with nature and landscape photographs that stand out from snapshots. Professional photographer Jim Crotty will guide you through field instruction along woodland paths and flowering meadows. He will provide classroom instruction on how to best edit and manage your digital photographs. The emphasis will be on learning how to make your camera work for you through basic understanding of camera settings, light, exposure and composition. How to “see” the resulting photograph while setting up for capture of the image will be stressed. Subjects range from wide landscapes to small often overlooked details of nature. (AD) Participants should bring a nut-free lunch that does not require refrigeration. Please bring an entry level DSLR (changeable lenses optional but recommended) or a point and shoot camera with manual exposure capabilities. Ages 18 and up Tuesdays and Thursdays, July 16 – 25 6:30 – 8:00 p.m. Bill Yeck Park, Smith House 2230 E. Centerville Station Rd. Fee: $75 residents, $95 nonresidents Registration deadline: Tuesday, July 9 Similar in content and format to the full-day workshop, with shorter class sessions. Professional photographer Jim Crotty will guide you through field instruction along the woodland paths and flowering meadows. He will provide classroom instruction on how to best edit and manage your digital photographs. The emphasis will be on learning how to make your camera work for you through basic understanding of camera settings, light, exposure and composition. How to “see” the resulting photograph while setting up for capture of the image will be stressed. Subjects range from wide landscapes to small often overlooked details of nature. Each class builds upon the previous, culminating in a final image sharing and critique. (AD) Please bring an entry level DSLR (changeable lenses optional but recommended) or a point and shoot camera with manual exposure capabilities. Jim will lead the group along beautiful trails, including both meadow and woods. He will guide students to capture their photographic discoveries through effective use of lighting and element arrangement within the camera frame. Time will be devoted to editing tips and managing digital images. (AD) Session A and Session B have the same content. Sign up for the session that fits your schedule! Please bring an entry level DSLR (changeable lenses optional but recommended) or a point and shoot camera with manual exposure capabilities. Registration closes 48 hours prior to program unless otherwise indicated. Getting Out & Enjoying Nature! (GOEN) Ages 18 and up 10:00 – 11:00 a.m. Three-hour Workshop and Meal Saturday, July 27 8:00 – 11:00 a.m. Bill Yeck Park, Smith House 2230 E. Centerville Station Rd. Fee: $30 residents, $36 nonresidents Registration deadline: Tuesday, July 23 Leave No Trace is an organization advocating outdoor ethics and conservation. Knowing the principles of Leave No Trace is essential when backpacking, hiking, kayaking, fishing, biking and more! Ages 18 and up Monday, July 15 10:00 – 11:00 a.m. The Enrichment Center at Rec West 965 Miamisburg-Centerville Rd. Enjoy this blast from the past as we discuss river otters of Ohio and observe some of their behaviors. Model healthy behavior from the very beginning! ADULT WELLNESS Tai Chi for Wellness Harvard School of Integrative Medicine tells us that the slow meditative movements, deep breathing and relaxation that is characteristic of Tai Chi practice create a special biological state that activates our capacity for body/mind wellness and healing. Great for stress relief, post-illness or managing a chronic health condition. Improves coordination, balance and attention. Facilitates cardiac rehab, lowers blood pressure and helps maintain strong bones. Strollers in Motion is a stroller-based workout for moms, dads or other caregivers. Each total body workout incorporates power walking and strolling, strength training, balance work and toning. Strollers in Motion is an awesome way to get fit, meet new people and have fun with your little ones! And, after some classes, special activities will be planned for the children! All new participants will receive a water bottle. Strollers in Motion is led by Strollercize® certified instructor, Caitlin Elliott. The week after each session ends will be used for rain out make-up days. (JH) Cancellations will be posted on the Strollers in Motion Facebook page. This boot camp version of Strollers in Motion will incorporate circuit training and station exercises. You will be able to move at your own pace and comfort level. We give modifications for every fitness level. Strollers in Motion Boot Camp is an awesome way to get fit, meet new people and have fun with your little ones! And, after some classes, special activities will be planned for the children! All new participants will receive a water bottle. Strollers in Motion Boot Camp is led by Strollercize® certified instructor, Caitlin Elliott. The week after each session ends will be used for rain out make-up days. (JH) Cancellations will be posted on the Strollers in Motion Facebook page. Tuesdays and Fridays, June 4 – August 30 9:30 – 10:30 a.m.
Tuesdays, June 4 – August 27 6:00 – 7:00 p.m.
*Overflow parking at The Gathering Church at 8911 Yankee Street. Environmental Science and Technology compared indoor and outdoor training and found that people who exercise outdoors have better energy levels, decreased tension, confusion, anger and stress than subjects who only work out indoors! Designed to get your heart rate up and get you moving! Staff and volunteers will lead you on these guided, selfpaced hikes. Hike for Your Health is also a wonderful opportunity to get to know your parks better. All hikes are on natural trails. Please wear appropriate shoes for trails that may be muddy. Up and Running will provide a trail leader as you enjoy running natural trails. This running group is for experienced runners and includes meadows, trails and hills. Meet at the Normandy Entrance (501 Normandy Ridge Rd.) of Grant Park and the Smith Entrance (2230 E. Centerville Station Rd.) of Bill Yeck Park. Ages 18 and up Wednesdays, June 5 – August 28 6:00 – 7:00 p.m. Cancellations will be posted on Up and Running Facebook and Twitter. Session A Saturdays, June 8 – July 13 7:45 – 8:45 a.m. Session B Saturdays, June 8 – July 13 9:00 – 10:00 a.m. Session C Saturdays, July 20 – August 24 7:45 – 8:45 a.m. Neighborhood Yoga Ages 18 and up 7:00 – 8:00 p.m.
Thursday, June 13 Green Park 6661 Green Park Dr.
Vinyasa Flow Thursday, July 11 Pelbrook Park 7566 Cloverbrook Park Dr.
Breathwork + Meditation Thursday, August 8 Willowbrook Park 10225 Park Edge Dr.
Ages 18 and up Tuesday, June 18 8:45 – 10:00 p.m. Bill Yeck Park, Smith House Entrance 2230 E. Centerville Station Rd. Time 4:00 – 5:30 p.m. 10:00 – 11:30 a.m. 4:00 – 5:30 p.m. 10:00 – 11:30 a.m. 4:00 – 5:30 p.m. 10:00 – 11:30 a.m. 4:00 – 5:30 p.m. 10:00 – 11:30 a.m. 4:00 – 5:30 p.m. 10:00 – 11:30 a.m. 4:00 – 5:30 p.m. 10:00 – 11:30 a.m. 4:00 – 5:30 p.m. 10:00 – 11:30 a.m. Looking for more fitness classes? Check the schedule at the Washington Township Recreation Center! They offer both registered and drop-in classes. Registration closes 48 hours prior to program unless otherwise indicated. Online registration tak es place the day before phone or wal k-in registration. Visit https://cwpd.recdesk.com to register. To expedite your registration, create an account prior to 10:00 a.m. on May 13. Centerville and Washington Township residents, please list Dayton as the city in your address or the site will not recognize you as a resident. This website can be used for free programs and for fee-based programs with a debit or credit card. Call us at (937) 433-5155 Monday – Friday between 8:00 a.m. and 4:30 p.m. Please have your credit card ready for fee-based programs. Phone registration begins one day later than online registration. r and pay The flexibility to registe time, any ce, ien ven at your con from anywhere. In less than fiv e minutes, you can set up your ac count and enro ll in your program. you’ll be Three simple steps, and your of m gra pro the in enrolled choice. lly friendly No need to use gas driv ing over to register in pe rson. And it saves paper. Online resident registration begins May 13. Visit Park District headquarters at 221 N. Main Street Monday – Friday between 8:00 a.m. and 4:30 p.m. You may pay with cash, check or credit card. Make checks payable to CWPD or Centerville-Washington Park District. In person registration begins one day later than online registration. •	Residents may register members of their family and one other resident family. •	Our intent is that program participants be completely satisfied with their experience! If participants are not satisfied with their program experience, or they are unable to participate in a program for any reason, they may repeat the program at no charge, receive credit toward future fees or receive a refund. Please contact us in advance if you require any special accommodations to participate in our programs. When registering for or attending any Park District program, you are required to agree to the following statement: In consideration of your accepting my entry or my child’s entry, I hereby, for myself or my child, release, indemnify, and hold harmless the Centerville-Washington Park District, its Commissioners, Agents, Employees and Assignees from any and all liability claims, actions, demands and judgments arising out of injury or loss sustained by me or my child while participating in activities or using facilities of the Centerville-Washington Park District. Explore Your Community’s BIG Backyard! It was a good year for your Centerville/Washington Township parks! The pinnacle may have been the recognition by the National Recreation and Park Association as one of the four best park agencies in the nation in our population category (30,001 to 75,000). But, much more important than the award, was the increase and improvement of services for residents. Enjoy reading this brief report. If you would like more details, just call or write. As always, the Park Board is eager to hear from you and to find ways to do more and better for you. PARK IMPROVEMENTS COMPLETED IN 2018 Per the District’s strategic plan, multiple improvements are to be added annually to neighborhood parks. 2018 was no exception. Here are some of the new amenities and upgrades to your parks this year: •	Paved paths added to Cherry Hill, Green, Greene Line and Wagon Trail Parks leading from sidewalks to playgrounds to accommodate wheelchairs, strollers, wagons, bikes, etc. One in each “quadrant” of the District! •	Gazebo installed at the Holes Creek Park trailhead. •	Tree carvings in Black Oak, Forest Walk, Grant and Village South Parks. •	Additional playground features at Brittany Hills, Green and Old Lane Parks. •	ADA automatic door and green parking lot added to the Kennard Nature Nook at Grant Park. •	Updated play features at the Mark Kruesch Nature Playce at Grant Park. DONATIONS We would like to thank the following donors for their generosity: •	Centerville Noon Optimist Club •	Penbrooke Garden Club •	The Militello Family •	Harry K. Oxrider III •	The Schierloh Family •	United Way of Dayton Additional donations were made in honor of: •	Doug Barchek •	Adam Bellnoski •	David Brown •	Jane Dawson •	Ezra Hartke •	Jaimee Maier-Francis •	Ruth Meyers •	Inez Noble •	John & Delores Siefker Every donation makes a difference! Each will help provide fun, healthy, and outstanding park experiences for generations to come. PROGRAMS & ACTIVITIES We are proud to have won a first place Ohio Parks and Recreation Association award in “programs for special populations” for last year’s Adapted Action Day. The event, for individuals with special needs and their families, demonstrated that recreational activities are for everyone by giving families the opportunity to try fishing, archery, kickball, biking and crafts – all adapted for inclusivity. Look for Adapted Action Day to return to Oak Grove Park this summer! More children enjoyed day camps, special events and environmental programs. Many new programs were possible by partnering with the Centerville City Schools, the Washington-Centerville Public Library and the Washington Township Recreation Center. In all, we had 15,000 program participants in 2018! We switched to a new registration software in 2018 to improve your program registration experience. VOLUNTEERS MAKE PARKS BETTER Your 50 parks are as good as they are because our residents and friends volunteer enough hours to equal one full-time park worker! This year, volunteers led nature hikes, taught hundreds of Centerville City School students, mulched trees, painted tables, pulled garlic mustard and much more! Thank you for donating your time to better your community! STAYING IN TOUCH WITH RESIDENTS All of the successes, parks, services and activities that residents enjoy stem from the Park Board actively listening to what you want. •	300 people gave input and opinions about upcoming improvements to Bill Yeck Park. •	40 neighbors of Pelbrook Park and Willowbrook Park helped to steer the future of the district’s neighborhood parks. •	405 youth sports parents rated athletic fields. •	Neighbors worked to initiate the conversion of the Hithergreen site to a park, and advocated for the State grant. •	More people than ever are keeping current with CWPD news by following the Facebook, Instagram and Twitter accounts! Please keep sharing your ideas, suggestions, and even complaints with us. All communication is valuable, and the more we hear from you, the better. We want to hear what is important to the community, so we can better serve you! We will continue to strive to meet your outdoor recreation needs.